Wonderful set includes upper and lower cabinets with slot and tab construction for perfect results. 1/65 plywood overlays for realistic doors and drawers. 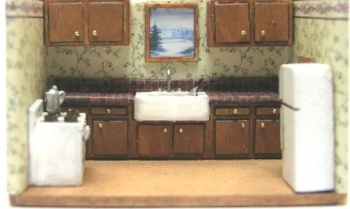 Kit includes, upper cabinets, lower cabinets with farmhouse sink, awesome stove and refridgerator. Cabinets are sized to fit the original bespaq baby house rooms.